Fun Makers provides mobile rock wall rentals throughout Ohio, PA, Michigan and West Virginia including the cities of Cleveland, Akron, Canton, Youngstown and Columbus. Make your event one that people are talking about long after it has ended, give us a call, and we will make you a celebrity in your community. 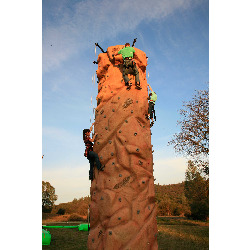 Features a 25′ high, auto belay, 5 person climbing wall. This ride brings excitement to all climbers as they conquer the top, with the crowds watching over two stories below. This climbing wall is set up for easy to medium climbing. Each lane has a difficulty. Super realistic looking rock wall with Auto belay system that provides the latest technology to insure your safety. This system eliminates human error in the belay process. (no mistakes from someone letting go of your safety rope). This wall safely accommodates up to five climbers at one time. Both children and adults from 45lbs to 250lbs can enjoy the challenge. Climbers must be a minimum of 42″ tall and must fit in the harness to be allowed to ride. Our trained staff insure your safety by properly harnessing individuals and then attaching them to the auto belay system. Our professional staff offers instruction and support to the climbers. Realistic looking wall with 5 climbing areas. This mobile climbing wall is 25' tall the Auto belay system provides the latest technology to insure your safety. This system eliminates human error in the belay process. Can be setup indoors or outdoors. For indoor events, 12'x12' door with drive in capabilities are required.